Barry Walton from Cheshire lost his wife to pancreatic cancer in November 2016. Ever since he has been determined to raise awareness of this disease and holds regular awareness stands as a representative of Pancreatic Cancer Action. 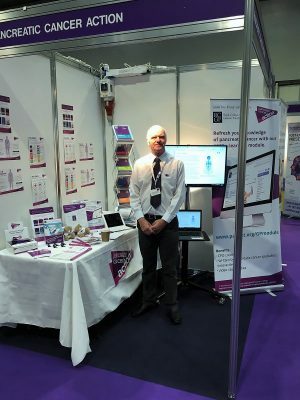 Last Wednesday and Thursday I was privileged to represent Pancreatic Cancer Action at the annual Primary Care Show held at the NEC, assisting Lucy de’Lemos (fundraising manager). I didn’t know what to expect as I entered the Exhibitors Hall but Lucy soon put me at ease. The show attracts many varied roles from the Primary Care sector, both NHS and Private, GP’s, Nurses of all descriptions, Podiatrists, Dieticians etc. One of the first things to strike me was how many GP’s were unaware of the Pancreatic Cancer Action’s GP E Learning Module, however, once told it is “Free” and CPD Accredited their enthusiasm peaks. By far the majority were eager to refresh their knowledge of pancreatic cancer and after a conversation, and in some cases gentle persuasion, accepted that by having it in mind after a couple of visits from a patient displaying symptoms it may be possible to improve diagnosis results. Unfortunately, this will take time to show if promises turn to actions. One of the biggest surprises, although perhaps should not have been, was how many health professionals admitted to having very little or no knowledge of this illness until a relation or friend is diagnosed. The other revelation was the willingness of some to pour out heart rending, sometimes through their tears, stories of their personal contact with the illness, be it family or friend diagnosed. So, where does all this leave us, despite all the hard work done by Regional Reps,I am new to this. Over several years, all the publicity, either deliberate or consequential, such as a celebrity having the illness, we and Pancreatic Cancer Action seem to have only touched the tip of the iceberg. The question is, how do we change this? Without perhaps a multibillionaire slipping a couple of million to pay for a television campaign. However, I remain positive knowing that I am making a difference by spreading the word and the more people that get involved the better the outcome. Find out how to support us!